AMD Ryzen processors have dominated discussion in the PC hardware community over the past couple of weeks, and that discussion isn't going away any time soon. 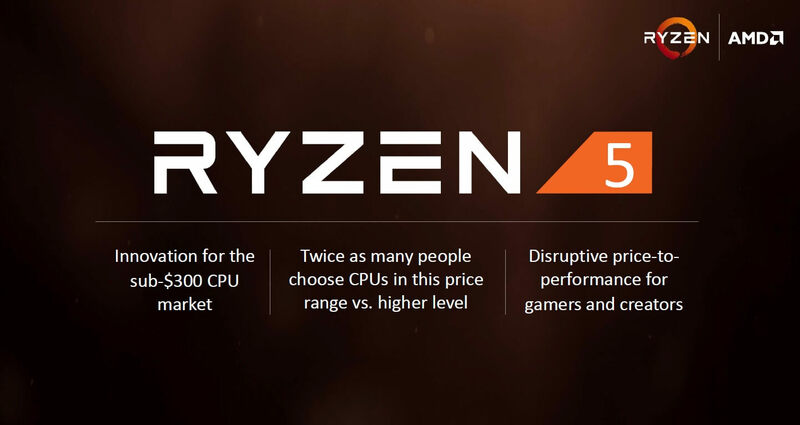 Today, AMD is announcing their Ryzen 5 line-up, which consists of two quad-core and two six-core processors, all of which will be available to purchase on April 11th. AMD's presentation on Ryzen 5 was short, so we're going to cut right to the chase. Everything we know about the Ryzen 5 line-up is included in the table below, but you can expect additional information – such as TDP and cache configuration – to be released at launch. As all Ryzen processors are unlocked, there are two parts which are very attractive here: the $219 Ryzen 5 1600 with six cores, and the $169 Ryzen 5 1400 with four cores. While the boost frequencies of these parts aren't hugely impressive, you should be able to overclock them to around or above the 4.0 GHz mark. The $219 Ryzen 5 1600 will compete directly with the $239 Intel Core i5-7600K, a four core, four thread Kaby Lake CPU. The Ryzen 5 1600 will have a core advantage, as it packs an extra two cores, while it also includes SMT support where the 7600K does not. It will be interesting to see how these CPUs compare when overclocked, as the 7600K can reach 5 GHz with relative ease. The $169 Ryzen 5 1400 undercuts Intel's entire quad-core line-up, and competes directly with their two-core, four-thread Core i3 processors such as the $189 i3-7350K. Of course, you shouldn't buy the 7350K over the unlocked $65 Pentium G4560, so the Ryzen 5 1400 will practically have an entire market segment to itself. AMD only provided one performance figure for their Ryzen 5 processors: the Ryzen 5 1600X outperforms the Core i5-7600K by up to 69 percent in the Cinebench multi-threaded workload. You'll be able to purchase a Ryzen 5 processor from your favorite retailers on April 11th worldwide. There is no official pre-order system for Ryzen 5, but you can expect to see plenty of stock on launch day. AMD's entry-level Ryzen 3 processors are on track for a 2H 2017 release.